Come on out for some Vinyasa Flow Yoga, meet your fellow community members, and learn about an amazing non-profit organization in our community: Hawai'i Wildfire Management Organization. Vinyasa Flow Yoga class from 5:30-7pm with Talk Story from 5-5:30 & 7-7:30pm. Learn about this organization, enjoy complimentary pupus and tea & enter to win free giveaways from local businesses. Admission is $20. All levels welcome. I am donating my time to teach this event to benefit the organization and would love to see you there! Begin 2017 with clear and loving intentions & vibrations! Start your year in community, in practice and in song as we flow though asana uplifted by live music from the talented and lovely Maylan Ackerman. We will chant mantra together to open and close the event with expansive and connected voices, hearts and spirits. CLICK HERE to download a delicious taste of Maylan's angelic voice as a preview for the goodness she will share with us! Please bring water and a yoga mat if you have one. Yoga mats are available to borrow if needed. All levels welcome!!! Come explore the union of the divine feminine and the divine masculine, as understood through a most cosmic love story » the union of Shiva & Parvati. We will dive into the sammelana (commingling) of spirit and matter, of being and becoming, utilizing myth, mantra, asana, pranayama and meditation. Delightful organic vegetarian nibbles catered by Under The Bodhi Tree will be on offer after the practice. All levels welcome. This event is held in celebration of my upcoming marriage to my partner Mark, and is offered FREE to participants! Please bring water, a yoga mat and yoga block if you have one. Come on down and get funky in your groove with a party-time Vinyasa Flow Yoga sequence set to Soul Music Classics from the 60's and 70's. We'll get on up and get down and get on up and get down. We'll keep it movin' from side to side, we'll move our hips from left to right. We'll let the music get deep down in our souls. As we free our bodies and free our minds, we allow our souls to shine. After the flow EZ's Big Island Catering: Comfort Food Island Style will serve up some down-home Soul Food; dinner included in the price of admission. The rockin' tunes will keep on spinning as we dine and after up 'til 8pm for those whose dancing feet got some groove left in 'em. The koshas are the sheaths, or the layers of ourselves in the yogic system. In this special event, you will be invited to explore each layer of yourself through movement, live ukulele music performed by Joey Bradley, breath work, meditation, and visualization. From the outside in, the koshas are: Anamayakosha (The Food/Physical Body), Pranamayakosha (The Pranic/Energy Body), Manomayakosha (The Mental/Emotional Body), Vijnamayakosha (The Wisdom Body), and Anandamayakosha (The Bliss Body). We will go spelunking deep within and discover our rich inner landscape. This event is open to all levels. Children are welcome provided they do not disrupt the group. We will finish off the evening with an organic vegetarian & gluten-free dinner catered by Sweet Potato Kitchen. 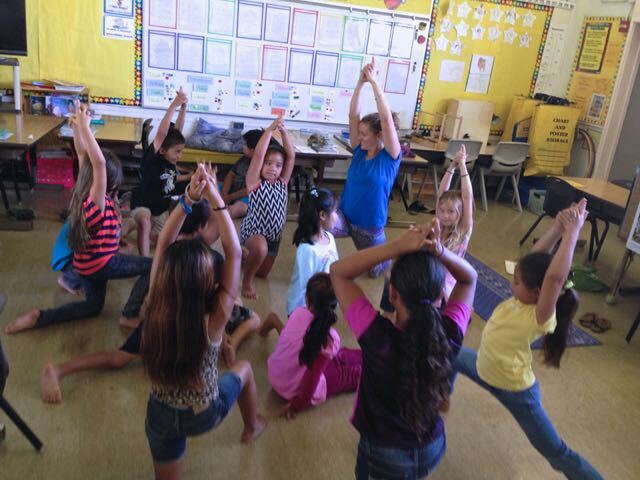 Keiki Yoga Kohala is an empowering yoga education and healthy lifestyles program now in its ninth year. KYK serves all 350+ students and their teachers at Kohala Elementary School by delivering 30 minute yoga sessions directly to the classroom. In a world where more emphasis is put on testing and less time is given to children for physical activity these classes are sometimes the only opportunity for a student to exercise and de-stress during the day! JOIN US Saturday, September 19 for the Keiki Yoga Kohala benefit - a mini yoga retreat taught by Jamie Eversweet, Maya Parish, and Chelsea Morriss that includes 2 yoga classes, an iRest Yoga Nidra class, a brief presentation about Keiki Yoga Kohala, a healthy lunch and opportunities to access wonderful prizes in a lucky number drawing. Click Here to register and reserve your spot! For more information, Click Here. Ganesh, the elephant headed god, is regarded and revered as the lord of thresholds, new beginnings, and overcoming obstacles. You are invited to learn more about him and celebrate him with me and special guest Noelani Love from North Shore Oahu on Friday morning August 7th in honor of my birthday. I will lead asana and tell stories about Ganesh, and Noelani will teach us Ganesh themed mantra and serenade us with her beautiful mantra music as we move through our practice. We will finish out the event with gorgeous healthy food catered by Under The Bodhi Tree, as well as the opportunity to purchase original jewelry designs crafted by Noelani. The event is offered on a donation basis. Journey through your chakras with a custom flow designed to open and activate each energy center. Beginning with the root and working up to the crown, we will work with asana, imagery, and focused subtle body awareness crafted to awaken and enervate each chakra, while also allowing for the release of any blockages we may find along the way. The flow will be accompanied by live mantra music sung and played on the ukulele by special guest Noelani Love. Homemade refreshments including gluten free banana muffins sourced from the banana tree in my yard, and fresh iced tea infused with lemon, ginger, and turmeric juice will round out the workshop.